If you think about it, someone my age (70 years old, but at this time I was 69) I should never have even considered the purchase of a Mangle (a rotary iron). The life expectancy of a rotary iron (also referred to as a mangle) is 30 years on average and many more years. Unfortunately, I have no one in my family who shares my passion for ironing to will this great machine to. So, it made no sense to entertain the idea of owning one. But circumstances led me to consider the purchase of that neglected appliance. 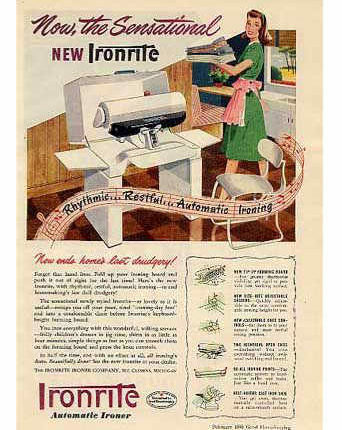 I had always been intrigued by my grandmother’s portable IronRite. It sat on the lid of her chest freezer in the large pantry off the kitchen. She would bring it out occasionally to iron table cloths, handkerchiefs, and napkins. Ironing has been a favorite pastime of mine ever since I can remember. In the 40’a and 50’s no one I knew even had the luxury of an appliance called a “clothes dryer” in their homes. All laundry had to be hung to dry outside. Laundry day consisted of first separating the clothes by color. Whites always went together so that we could add the obligatory Clorox bleach to the water; colored clothes were placed together-leaving the bleach out. The Clorox was packaged in a brown colored gallon glass jug. If a load or two of wash needed to be starched, we would stop the washer before it went into its last rinse cycle, add starch powder which we would first dissolve using warm water, and add this mixture to the tub of clean, still wet clothes in order to distribute the starch on the fabric. When the cycle was complete the heavy, wet clothes would then be lugged outside in a colorful, oil cloth lined bushel basket (my mother’s liner sported a pattern of red fruit on a white background). The basket of articles would then be clothes pinned to the clothes line to dry in the sun. Mother Nature took care of drying the clothes, which made the laundry smell of the outdoors. You can imagine the dilemma laundry day posed during rainy days. If clothes couldn’t be dried outside, inside racks were used-and maybe a radiator was pressed into use as a quick way to dry laundry. When it came to “whites” (diapers, dishtowels, bath towels, etc.) the exposure to the sun made them come out snow white. Today’s whites are less “white” than they were back then. Bleach just does NOT do the job (no matter what the advertisements espouse). The dryer is a matter of convenience, yet I do miss the brilliant white that laundry would exhibit when billowing in a soft breeze. When the clothes were dry, we would take each item off the line as you folded each piece. Of course, some of the laundry had to be pressed. Blouses, shirts, pants, and skirts had to be ironed. Even after “sanforized” cotton was patented, (a method of pre-shrinking and pressing cotton bolts repeatedly) clothing made from this fabric still needed to be starched and pressed if you wanted to look your best. Other than silk and wool, most wardrobes were made of cotton. The clothes destined for the iron, first had to be “dampened”. This would take up the entire kitchen table. Each piece had to be spread out (dampening one side and then the other) by using a hand dipped in a bowl of water. Using a gesture like trying to free your hand from something sticking to it, then shaking water off your hand and onto the fabric did the trick. Then the article would be folded and rolled like a burrito to be placed in a plastic bag for a few hours or overnight in order for the uniform distribution of moisture to help facilitate the ironing process. Sometime in the 1950’s or 60’s, Hints From Heloise suggested that you could shorten the time to half an hour if you placed your plastic bag of clothes in the freezer. It worked well enough in a pinch. Laundry certainly was labor intensive. For a family of four girls, my mother had a ton of laundry that seemed never ending. My memories as a child was coming home from school to the smell of homemade bread baking in the oven and mama standing over her ironing board, pressing my father’s work pants and shirts, and all the dresses that my sisters and I wore to school. Of course, among the dampened clothing was my mother’s aprons and her wrap-around house dresses. Her aprons and house dresses were embellished with rick rack and bias tape in contrast to the overall printed pattern of color of the item. Mothers did not wear jeans or pants at all during this time. Whether relaxing having a coffee klatch or doing house work the attire of the day was always the ubiquitous house dress and apron. The everyday event that I was fortunate to have experienced was having a mother there when I arrived home from school each day. Things have changed dramatically since then. I can’t help but think that the loss of this experience shapes us differently. Having someone at home, going about the business of taking care of the family’s needs, provides a sense of security and trust-a thing that we can count on. Getting back to my “hobby” of ironing; my daughter-in-law lovingly chides me as being mental for liking to iron. I’m pretty sure that she is kidding about her assessment of my avocation, but I have always looked at the exercise as a quiet time that is my own. Standing at my iron allows me to meditate or allows my mind wonder. All the while, I gain the utility of taking a wrinkled piece of clothing by pressing out the complications offered up by the raiment in my bag. We don’t seem to make time like that in our busy schedules today. It is a missing element in our daily routine that could possibly lower our blood pressure, as well as help eliminate our stress level. If ironing can provide all that, plus provide our family with a crisply pressed outfit for the day- its a win/win as far as I’m concerned. Fast forward to now, a year and a half ago-out of the blue, my husband and I purchased a new Airstream trailer. Making it our “own” by outfitting it with accessories that reflected our taste was so much fun. My better half decided, among other things, that he wanted a linen duvet cover with shams. I revolted. As much as I love to iron, I was not about to take on the task of laundering and ironing such a purchase. It was way too much fabric for my manual iron to handle. Enter the possibility of becoming the proud owner of a rotary iron. To say that I was totally immersed in the research of all the brands available in the U.S. (along with a peek at what was in Europe) was an understatement. I found that there really aren’t many brands still around. 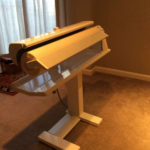 With prices starting at $1999.00 for a “dry” rotary iron and going up to $2,999.00, plus for a steam rotary iron, it became clear that getting one in the first place was not really justified. Even though I was actually lusting after a rotary iron that included a steam setting, spending an extra $1,000.00 seemed totally unrealistic. Much research and many Youtube views later, I settled on a brand and off we went to the dealer. Once we were at the store, and made the announcement of what our plans were to purchase, the salesperson asked us to please wait while he disappeared to the warehouse. He was gone for quite some time. When he returned he asked us what we thought was a crazy question. “If I have a rotary iron in our warehouse, would you be interested in purchasing it?” I was giddy with the prospects that I could take one home that very day and not be forced to wait for the order to be placed and then delivered. As it turned out, the dealership had purchased a rotary iron for display purposes-but it never made it to their showroom floor. It had been occupying precious warehouse space for several years-9 to be exact. Obviously, I jumped at the chance to buy this iron. After all, it had been patiently waiting for me to give it a new home. After setting up my new iron at home, I took a photo from my phone and sent it to my three-year old granddaughter. I announced that the machine in the photo was my new “toy”. My enthusiasm must have come through loud and clear, because the next time she visited she couldn’t wait to see my new “toy” in person. After this unexpected adventure, I realized that I couldn’t just use my new mangle to iron my linen duvet cover. I was committed to include table cloths, napkins, Yukatas (that’s another story) and best of all-our bed sheets. The most impressive thing that changed my appreciation of this tool came when I ironed my first set of sheets. I had routinely ironed our pillow cases-not so much of a problem with a manual steam iron, but unless you have slept on ironed sheets-you can’t know the life-changing feeling that comes over you. If you have ever slipped into a freshly made bed with ironed sheets, you will notice it right away. You’ll have a cool, silky slumber. I realize that I will never convince everyone to take up ironing as a therapeutic endeavor. It just doesn’t sound possible that such a mundane task could have priceless results, but it can. I invite you to try.